Senior Tiffany Holmes pulls up for a close range jumper in traffic. Her leadership proved crucial, as South Pasadena fought for momentum. The team holds onto second place following the victory. 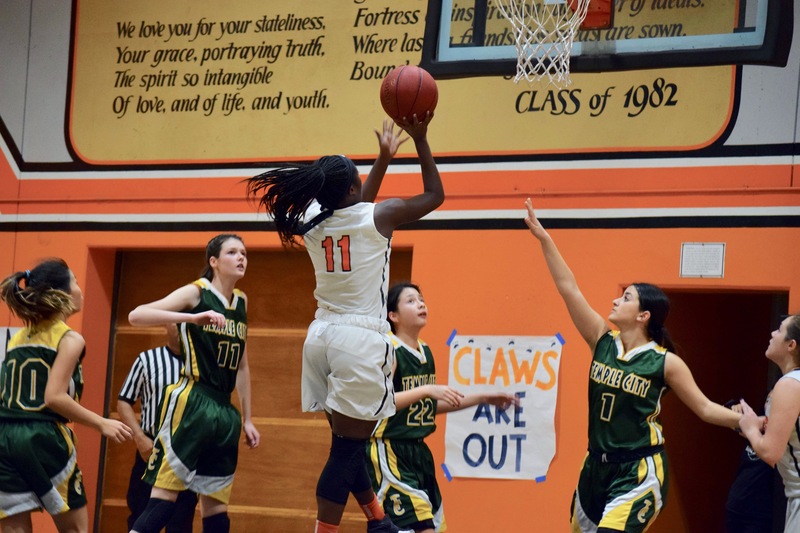 After its brutal loss to La Cañada last week, the Tigers redeemed themselves against Temple City, claiming a 40-37 victory on February 6. The senior night was a nail-biter of a game, with the lead changing frequently and victory never assured, but the Tigers wound up on top by three points. Junior Kayla Zhang dribbles in transition, while moving downcourt. When the game began, it was clear that this would be no easy win for either team. The Tigers and the Rams proved to be evenly matched in speed and athleticism. The Rams struck first, but a fouled layup from senior Tiffany Holmes put South Pasadena ahead by one point. The crowd was electrified that day and every Tigers point prompted deafening applause. The Tigers got further ahead when sophomore Megan Yee scored after a flurry of passes cut through the aggressive Rams defense. This lead was short-lived however as Temple City’s equalizer came soon after in the form of a three-point shot. At the end of the first period, the score was tied 7-7. The Tigers began their second quarter struggling to sink the three-pointers that they needed to swing momentum. Holmes and Yee continued to be powerful forces in the paint, but the Rams pulled ahead, leading 17-15 at the half. 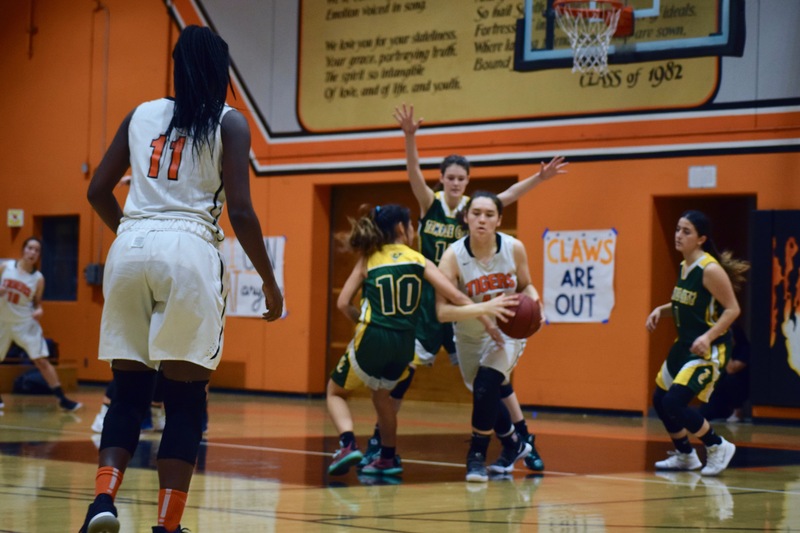 Despite trailing behind, the Tigers got their heads back in the game and started the third period off with a three-pointer from sophomore Charlize Kruzic. This started a relentless assault from the Tigers that allowed them to hold onto the lead. 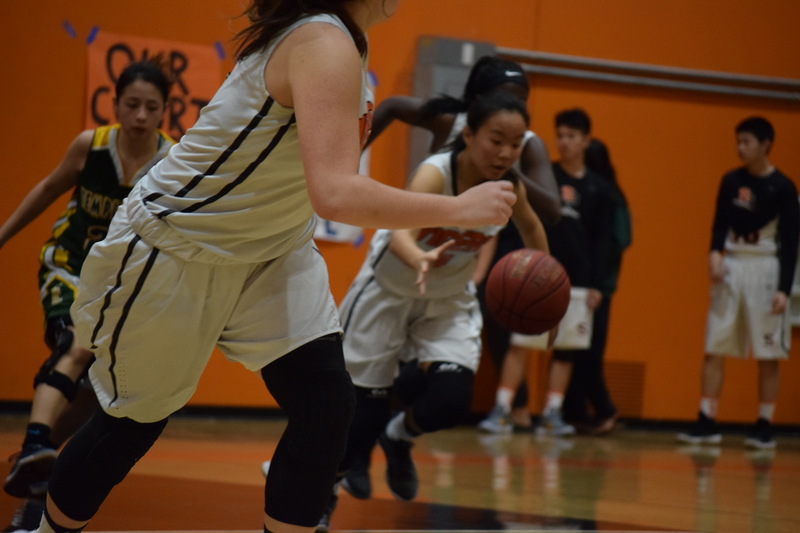 Strong defense by junior Lauren Kafkaloff prevented the Rams from surpassing the Tigers’ and by the end of the third quarter, the score was 27-24, Tigers. Junior Lauren Ka pivots in the paint while trying to pass to a teammate . South Pasadena fought hard to hold onto the lead throughout the final period, battling a particularly aggressive and desperate Temple City. Once their opponents reached seven team fouls, however, it was clear that the Tigers would emerge victorious. The game ended with senior Naomi Kruzic catching a rebound from the Rams. Afterward, the team celebrated their senior night awarding the seniors who had dedicated so much time to the team. The Tigers final game of the season is an away game against Blair on February 7.